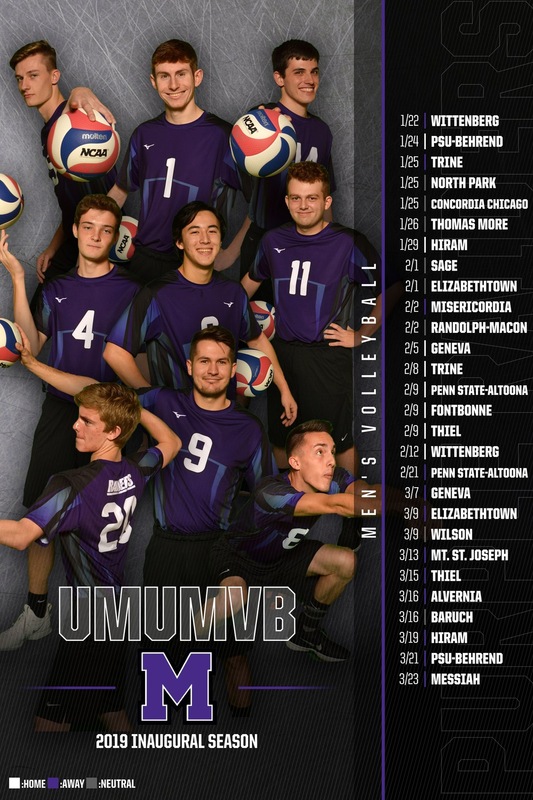 DALLAS, Pa. -- Mount Union's men's volleyball team dropped a pair of matches to Misericordia (Pa.) and Randolph-Macon (Va.), each in four sets, on the final day of competition at the 2019 Cougar Kick-Off Classic. Against Misericordia (5-2), Mount Union (4-7) lost by scores of 18-25, 25-21, 15-25 and 22-25. Freshman opposite hitter Mark Bruns (Columbus/Upper Arlington) hit .333 to lead the team with 14 kills, coming off of Jeremy Leyden (Cuyahoga Falls/Archbishop Hoban) who recorded 34 assists in the match. Defensively, freshman libero Steven Grenier (Hawthorn Woods, Ill./Lake Zurich) collected a team and season-high 10 digs. Protecting the net, freshman outside hitter Kaleb Krebs (Pittsburgh, Pa/Seton LaSalle) was ahead of the group with four blocks. Against Randolph-Macon (3-3), the Raiders went 25-21, 11-25, 20-25 and 25-27. Bruns led all hitters with 16 kills as he was accompanied by sophomore outside hitter Justin Sibbel (Stow/Stow-Munroe Falls) who had 10. Leyden continued to set the offense with 33 of the team's 38 assists. Seven different Raiders logged digs in the match as Grenier remained the leader with seven. Freshman middle hitter Sam Matonis (Macedonia/Walsh Jesuit) accounted for half of Mount Union's blocks with three. Mount Union returns to Alliance for a week-long homestand, starting with a match against Geneva (Pa.) Tuesday, February 5 at 7 p.m.